In this solo cooking adventure, Gary makes a vegetarian fried rice so loaded with goodness that there’s no need for meat. Buoyed by my successful attempt at turning Singapore Chow Mein into its equivalent in fried rice and with plenty of madras curry powder sitting around, I decided I wanted to make another fried rice with it. But not just any fried rice – no, this one was going to be a strictly vegetarian one that would be loaded with so much stuff in it, you’d hardly miss the meat. Stuff like nuts, dried fruit, and, most importantly, a little sweetness thanks to some pineapple. Yes, this was going to be a variation on the traditional Hawaiian or Thai fried rice. Like with most other fried rices I’ve made in my time, it all starts with properly cooked day old jasmine rice. With that safely tucked away in my refrigerator, it was time to figure out what I wanted to put into it. The pineapple was a definite but what sort of nuts or dried fruits would go with it? Tradition would dictate that I go with macadamia nuts but I’m not a big fan of cooking with them so, instead, I went with cashews. For the dried fruits, I chose currants for no reason other than I could. Since this was a vegetarian and not a vegan fried rice, eggs would also be included. With the main ingredients sussed out, it came together like any other fried rice – some aromatics, the eggs (previously partially cooked), the protein, the rice, and then the sauce. Let’s face it kids, fried rice ain’t exactly rocket science. Yes, it can be screwed up (read about Bittman Bonanza if you don’t believe that) but all you’re really doing is layering on different ingredients, combining them, and heating it through. Just be careful not to let it get too wet and give it plenty of space in the wok or pan to stay ripping hot and you’re pretty much guaranteed a successful fried rice. 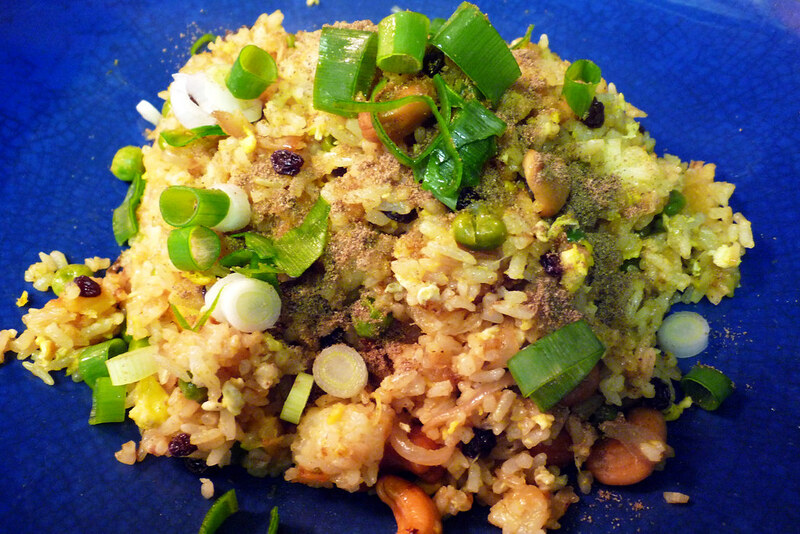 At the end, just plate the fried rice, add some chopped scallions, and sprinkle some fresh coriander, if you got it. That’s it. Now eat. Combine the soy sauce with the Madras curry powder. Set aside. Cook the eggs in a pan, letting them set for a few seconds before quickly scrambling them. Let them cook for a few seconds and then remove from the pan just short of being cooked all the way through. The eggs (whites and yolks) should still be somewhat runny. Heat 1 to 2 tablespoons of canola or vegetable oil in a wok or large pan over medium-high heat. When the oil is hot, add the shallots, garlic, and chili. Stir fry for approximately one minute until fragrant. 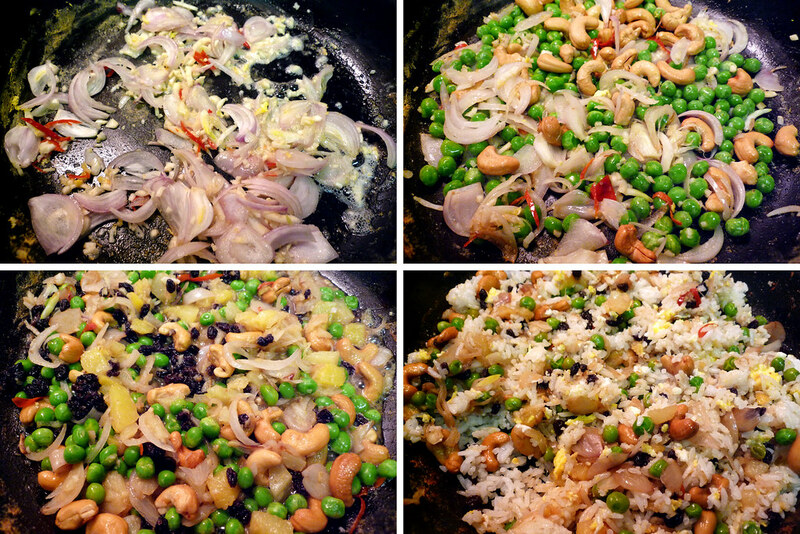 Add peas and cashews, sitr-frying for a minute to heat them through. Add pineapple chunks and currants. Stir to combine and allow for a minute to heat through. Add the rice and eggs. Stir to combine. 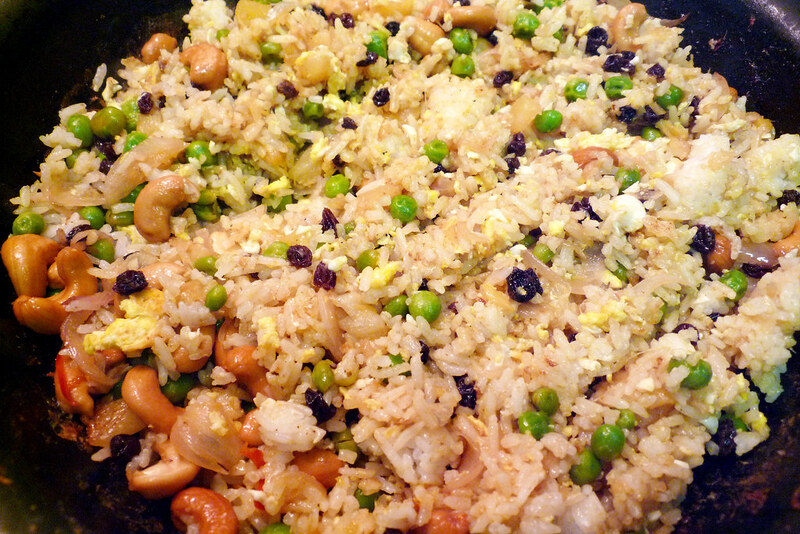 Evenly distribute the soy sauce and curry mixture over the fried rice. Stir fry to combine and continue doing so until the rice crisps a little. Remove from heat. Serve with chopped scallions and some coriander powder. I’m wishing I had some cashews in my pantry right now, because this sounds great for tonights dinner. @Joseph Have you made it since? How’d it turn out?